Research in the laboratory of Rebecca Wingert, the Gallagher Family Associate Professor of Adult Stem Cell Research in the Department of Biological Sciences at the University of Notre Dame, has confirmed the key role of a certain small molecule in the development of kidney structures in zebrafish, a widely used model for human kidneys. The discovery could help advance understanding to address issues such as birth defects and repair of the kidney after illness or injury. 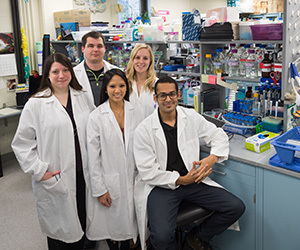 Using an innovative screen approach that graduate student Shahram Jevin Poureetezadi designed, the team exposed zebrafish embryos to small molecules, prostaglandin E2, from a chemical library of such molecules known to be active in cell development generally. The researchers wanted to identify small molecules that regulate or modify development. They discovered that activating or interrupting the prostaglandin pathway has a direct impact on the kidney, meaning that it is essential for normal development. The discovery is the culmination of six years of work in the lab, assembling various genes that are important for making kidney cells. Now that the pieces are being connected and the role of prostaglandin is established, Wingert will turn attention to gaining a deeper molecular and mechanistic understanding of how the molecule works in kidney development, especially the gene targets of the signaling. Prostaglandin E2 regulates the formation of blood stem cells and is known to influence the choice between the formation of the liver or pancreas. Based on the new findings, Wingert speculates that prostaglandin E2 may have critical effects on renal stem cells. In the long term, she expects to investigate whether the pathway has relevance for kidneys’ regeneration or failure to regenerate. A paper on the work, “Prostaglandin signaling regulates nephron segment patterning of renal progenitors during zebrafish kidney development,” was published in the journal eLife this week. In addition to Wingert, authors include Poureetezadi, Christina N. Cheng, Joseph M. Chambers and Bridgette E. Drummond, graduate students in her laboratory, the Center for Stem Cells and Regenerative Medicine and the Center for Zebrafish Research. Originally published by Gene Stowe at news.nd.edu on December 21, 2016.